A quotation from Dr. Randolph Harrison McKim, who went from the ranks of the Confederate Army into the Ministry, and was the rector of Epiphany Church in Washington, D.C.
Below is a list of our members Confederate Veterans Ancestors, which their membership represents and honors. It is their memory, their cause, and their heritage that we honor. We will never forget and we stand against all who would eliminate, disparage, and defame them and their hallowed memory. Tinsley Alexander Greenway - Private, McMullan Guards, Co. D 37th Regt. GA Inf., (formally Co. A, 9th battalion, Georgia Vol. Inf. ), Army of Tenn., CSA Hart Co. Ga. Died and buried at Bean's Station, TN. November 05, 1862. James Chambers Hall - 2nd Lieutenant Oct. 15, 1861 Co. H, Goshen Blues, 38th Regt. Ga. Inf. Elected 1st Lieutenant June 1, 1862. 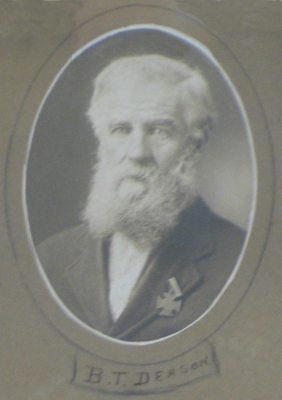 Promoted to Captain, 1862. Died of typhoid fever in Warwick House Hospital at Lynchburg, Va. Aug. 16, 1862. Buried at Hall Family Cemetery, Goss community, Elberton, Elbert Co. Ga.
Gideon R. Bass - Private, Co. B 39th Regiment, Miss. Inf. POW Port Hudson Louisiana July 1863 paroled July 1863 Enterprise, Miss. Co. K 14th Regt. Confederate Cavalry Vols. POW Citronella, Ala. May 04, 1865. Paroled May 12, 1865 Gainesville, Ala. Died Nov. 28, 1906 Buried at Bethlehem Cemetery, Voan, Ark. Stephen C. Bates - Private, Co. B 10th Regt. Ark. Cav. Died Dec. 13, 1913 Buried Goodner Cemetery, Oden, Ark. Silas Doby - Private, 14th Georgia Regimemnt, Company I, nicknamed "Jeff Davis' Rifles". (Pictured Right) The 14th Georgia Infantry Regiment was organized in the spring of 1861. Ordered to Virginia in July of that year, the unit served under General Floyd in the Kanawha Valley then was assigned to General Wade Hampton's, J.R. Anderson's, and E.L. Thomas's Brigade, Army of Northern Virginia. It was active from Seven Pines to the surrender at Appomattox. The regiment had 379 men when they left Georgia. When General Lee surrendered, 20 officers and 147 men remained. On the return home, they encountered multiple Union troops that fired upon then, not knowing The War was over. Silas lost his right eye during December of 1862. Despite this loss, he continued to serve and fight for the Confederacy. Of note, Silas and his unit took part in the infamous "Pickett's Charge" at Gettysburg. 12 percent of Company I was lost during the charge. After the war, Silas returned to Jackson, Georgia in Butts County to resume his life as a farmer at his small family farm. He married Mary Ann Elizabeth Deason Blanks, in 1866. Mrs. Blanks was widowed during The War when her first husband, Simon S. Blanks died as a Prisoner of War in the infamous Camp Douglas prisoner camp located outside of Chicago, Illinois. He was captured after being seriously wounded in the Battle of Chickamauga. Prior to the war, the Blanks had a daughter, Mary K. Blanks. 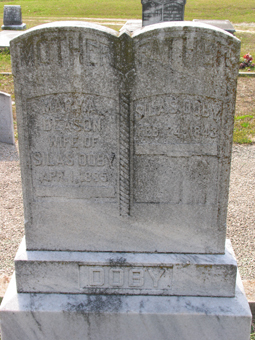 Silas and Mary Ann had two sons; James T. and Robert A. Doby. Silas was a member of the United Confederate Veterans, Camp Barnett #1114. He was awarded the Southern Cross of Honor by the UDC (date unknown). Silas died at age 89 on February 1, 1928 after suffering a massive stroke a week before. He was buried in Macedonia Baptist Church Cemetery, outside of the city of Jackson. Silas is Hal Doby's Great-Grandfather. Benjamin T. Deason - Private. Company A of the 30th Georgia Infantry Regiment. (Pictured Left) Service Records indictate this division fought mainly in Georgia, particularlty in the Battle of Atlanta. He was eventually wounded in the neck and jaw during the Battle of Franklin, Tennessee (November, 1864) where he was taken prisoner and sent to Camp Chase until the end of the war. After his release at the end of the War, he returned to life in what is now Jackson, Butts County, Georgia. Benjamin was the brother of my great-grandmother, Mary Ann Elizabeth Deason Blanks Doby. He died of natural causes at age 78 on November 14, 1922. Benjamin died at age 78 on November 14, 1922. His final resting place is unknown. Benjamin is Hal Doby's Great-Uncle. 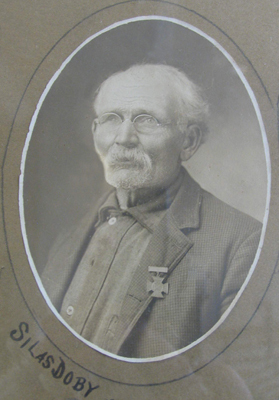 Simon S. Blanks - Private, Company I of the 30th Georgia Infantry Regiment. He was severely wounded and captured by Union Forces in the Battle of Chickamauga,fought September 19–20, 1863. He was wounded on September 15th and capture. He was taken to Camp Douglas Union POW Prison, Chicago, Illinois. Simon eventually died from his battle injuries. He was eventually buried in Moultrie Georgia. Simon is Hal Doby's Great-Step Father. 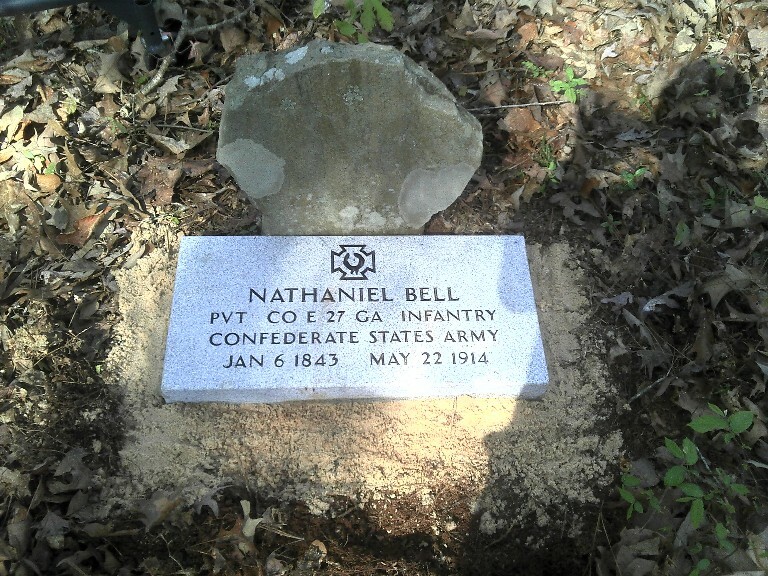 Nathaniel Bell - Private, Company E, 27th Battalion, Georgia Infantry, Newton County, Georgia. Nathaniel died on May 22, 1914 and is buried in Old Zion Cemetery, in Newton County, GA.
Elijah Grissom New - Private, Company C, Cobb's Legion, DeKalb County, Georgia. Elijah died on March 19, 1915 and is buried in the Redan Town Cemetery, in DeKab County, GA.
Theophilus Simonton - Sgt Company K, 66th Regiment, Georgia Infantry, Walton County, Georgia. Theophilus died on February 24, 1864 and is buried in Sodom Cemetery, in Rockdale County, GA.
Phillip J Odom - 2nd Sgt., originally enlisted Co B, 27th Tennessee Infantry in 1861 then discharged & enlisted July 6, 1863 in Co F, 21st Wilson’s Tennessee Cavalry. Wounded in shoulder at Heaton’s Ridge (McNairy Co, Tenn.) about Jan 1865. While at home recovering was taken into custody as Guerilla and imprisoned Nashville, Tenn. Pension file application says he escaped prison and rejoined unit until paroled at Gainesville, Ala in May 1865. Permanently disabled from wound. Died 1904 and buried McNairy County, Tenn.
Isiah Simpson Perry - Private, enlisted August 1, 1861 Co B, 27th Tennessee Infantry. Detailed Dec 25, 1861 to be Acting Assistant Surgeon. (was physician in civilian life). Died in camp (disease?) at Tupelo, Miss on July 8, 1862. Buried near Tupelo in a grave that was once marked but exact burial site cannot be located. Samuel H. Perkins - Private, enlisted April 22, 1862 at Crawfordsville, Miss in Co F, 35th Miss Infantry. Captured at Kennesaw Mountain, GA about June 30, 1864.Sent to Louisville, Ky then to infamous Camp Douglas. Died of smallpox on Nov 24, 1864. Buried in “Confederate Mound”. Name listed on monument. at mound. Jesse Martin Odom - Private, enlisted Dec 3, 1861 at Columbus, Ky for 1 year and reenlisted at Corinth, Miss for 2 more years in Co B, 27th Tennessee Infantry. Captured Nov 25th, 1863 at Missionary Ridge, Tenn. Sent to Nashville, Tenn. and then Louisville, Ky and arrived infamous Rock Island, Ill prison camp on December 8, 1863. Listed on prison rolls until Dec 25, 1863 but no record of him after that date. Never returned home to wife and 7 children. Believe buried in unmarked grave at Rock Island. Harvey Blackburn Wade - Private, known to have served in Co I, 34th Tennessee Infantry Regiment but records for individuals have been lost and rosters are incomplete per “Tennesseans In The Civil War” so his exact service is unknown. Unit also called 4th Tenn. Volunteers, 4th Tennessee Infantry Regiment and individual companies appear to have previously been in existence under different unit names until partisan units were made part of formal Regiments. Died 25 April 1889 in McNairy County Tenn. Unit surrendered and paroled with rest of Joseph E. Johnson’s army at Greensboro, N.C. May 1, 1865. Andrew Lafayette Sylar - 2nd Corporal, Co. B 32nd Regt. Ark. Inf. May, 28, 1862 Cotton Plant Ark. Captured at Helena, Arkansas July 4, 1863. POW records shows as prisoner at Alton, Ill. Records show out of service May 20, 1865. Died Dec. 12, 1887, buried at Midway Cemetery, Phillips, Ark. near Walnut Cornner. J. Polk Underwood - Private, Alexander's Company, Georgia Guard, Died Dec. 24, 1916 buried at Bethel Christian Church Cemetery in North Rockdale County. George Roland Thompson - Private in Company H, 27th Regiment Georgia Infantry “Zachry Rangers” was born on March 8,1820 in Jasper County, Georgia and died May 28, 1864 in a field hospital in Charleston, South Carolina of what was probably Typhoid Fever. He is buried in the Magnolia Cemetery in Charleston. George T. Maddox - Private in Company B, 53rd Regiment Georgia Infantry was born in Georgia in 1834 and probably died on April 6, 1865 at the Battle of High Bridge, Virginia. As witnessed by his brother-in-law, William Thurmond Stroud Jr., he went into the battle, vanished and was never heard from again. 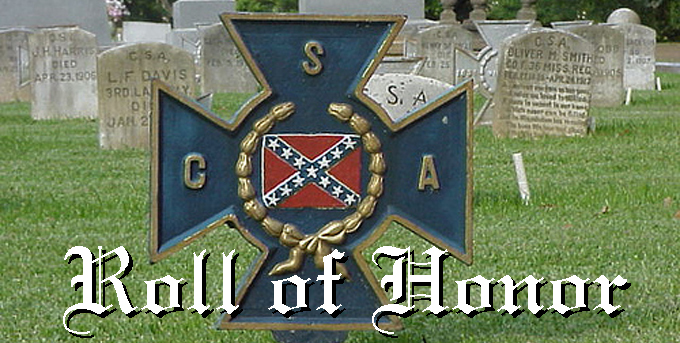 We urge and invite any member of our encampment to list his Confederate ancestors on our Roll of Honor. To Honor your Confederate Veterans, please click on the link below to open and printout an Adobe Acrobat form. Submit your completed form to our Camp Adjutant or Web Master for processing. Please include as much information about your ancestor as you wish, photos are very welcome inclusions! We will strive to include your ancestors on this page usually within 30 days of submission. Copright 2015 Major General Joseph Wheeler SCV Encampment #863, All rights reserved. This site was created using Adobe Dreamweaver and should be suitable for viewing on all web browsers. Please Note: Portions of the content presented here require Adobe Acrobat/Reader, Adobe Flash Plug-in, and Java in order to properly function as intended.